Sometimes the fewest words say the most. "Hahahaha this is the best!!!! Thanks!!! I love my spider box!" "Oh my goodness! I just about died laughing when I got some payback on one of my coworkers the other day. He is always pranking me and this was awesome payback! It makes me laugh anytime I think about it..."
"This thing is about the funniest thing I've ever seen. People are such suckers for finding out what's in my little spider box. What a total hoot!" "Are you serious!? These spiders are so freakish! I thought my husband was going to have a heart attack when he opened the box. He nearly fell over trying to get away from it! :-) Thank you for such a hilarious product. We totally love our spider prank box!" "The spider scarebox came today in good order. I set it on the kitchen counter and watched for my daughter to come in after school. I just didn't say anything and let her find it on her own. When she did she screamed so loud and literally threw her Pepsi in the air as she jumped back from the spider. Made a big mess, but I couldn't stop laughing. Even now I chuckle inside every time I think about it. Just thought you'd get a kick out of what happened. Good luck and continued success!" 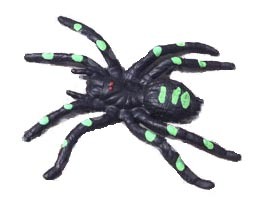 To send us your spider scare box testimonial, please submit it to us here.